It was and remained a wet and windy day when we met in the car park of the Saltwells Nature Reserve at 10.00. Tom Weaver from Dudley Council led the day’s clearance work at the Brewin’s Canal Section, below Brewin’s Bridge, adjacent to the Dudley No.2 Canal. The clearance work involved removing vegetation and a lot of soil from the exposure to the east of the bridge to improve the view of the underlying outcrop. 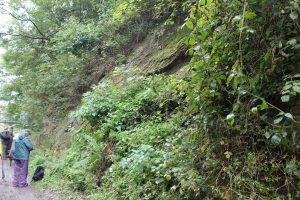 We did not do any clearance work to the west of the bridge where the same outcrop and a dolerite intrusion currently remain hidden behind thick vegetation. This exposure shows two markedly inclined beds of sedimentary strata dipping towards the east. These include Middle Carboniferous Pennine Lower Coal Measures (formerly Westphalian C) overlying Late Silurian (Pridoli) strata. 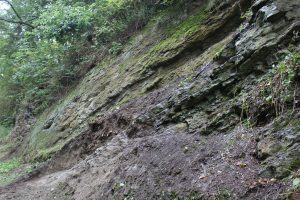 The Carboniferous strata comprise reddish-brown and greenish-grey mudstones/shales including coal pockets and sandstone, with a layer of clasts within a finer matrix towards the base. The Silurian strata comprise greenish-brown mudstones belonging to the Raglan Mudstone Group (formerly the Red Downtownian), which in turn overlie the Temeside Mudstone Formation (formerly the Temeside Shales). The contact between the Carboniferous and Silurian strata represents 100 million years of missing geological history, including Devonian and Lower Carboniferous strata. The Carboniferous and Silurian beds dip at slightly different angles, making this contact an angular disconformity. The contact between these two strata represents a major mountain building period, the Caledonian Orogeny, which was a result of the Avalonia/Baltica landmass colliding with Laurentia. This event caused the closing of the Iapetus Ocean and the formation of the Caledonian mountain chain. The chain formed part of a landmass, known as the Wales-Brabant Massif that stretched across Wales and central/southern England. 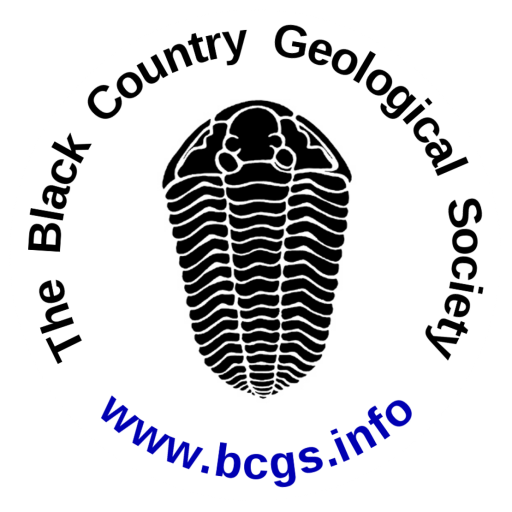 It was on the northern edge of this landmass that the Black Country sat in mid to late Carboniferous times. The Dudley No.2 Canal was constructed between 1792 and 1798, connecting the Dudley No.1 canal at Park Head Junction in the north-west with Halesowen in the south. The canal served the Netherton collieries where the Thick Coal fields were worked. At just over ten miles in length it was constructed to follow the local contours and passed through several tunnels along its route. Whilst skirting round Netherton Hill the route of the canal intersected a dolerite dyke which had to be cut through (where Brewin’s Bridge now stands). Originally the cut was a tunnel, the Brewin’s Tunnel. During its construction a mass grave containing numerous bodies was discovered. The discovery terrified the builders, who, believing that they had disturbed a Celtic burial, sort solace in a local pub. The grave later turned out to be a mass grave of cholera victims from the 16th century, who were subsequently relocated to the graveyard at Netherton Church.